Kaity Thomson in New Hampshire posted a YouTube video of her exchange with Senator Ted Cruz about her concerns over climate change (code phrase for human-caused-catastrophic-global-warming). Kaity claims she was insulted by Sen. Cruz. Yet the video she posted clearly shows Kaity repeatedly interrupting Sen. Cruz as he tried to respond to her questions. One is left with the impression that Kaity wasn't really interested in hearing Sen. Cruz's responses. Regarding your recent exchange with Sen. Ted Cruz over climate change, I hope you will take a little time to carefully consider the facts and advice that follow below. You seem like a bright, young, enthusiastic woman, passionate about her ideals. But if you want to be taken seriously and have your concerns given due consideration, it is very important that you be considerate of those you view as your adversary. For example, when engaging others on any topic, civility demands you curb your passions sufficiently to listen respectfully to their response, remaining silent until they have finished replying to the concern you raise. Always be prepared to reexamine your premises because they may be faulty. We learn by listening, not by speaking or "motor mouthing" to drown out those with whom you may disagree. When you confronted Sen. Cruz with your views on climate change, you repeatedly asserted that, because Cruz was not a "climate scientist" he had no right to an opinion different from that of your college professor who, apparently, claims to be a climate scientist. Is it your view that all scientists must share the same views? Do you believe college professors are infallible? "I'm a recent graduate of the University of New Hampshire. Thank you. One thing I learned is that the Gulf of Maine is warming. That's causing lobsters to move off shore. I learned that in my university, a public university. That is caused by climate change. So are you saying that you disagree with what public universities are teaching students?" Do you realize that your ending question does not logically follow from what precedes it? Do you understand that your statement concluding, "That is caused by climate change." is reasonably disputed? Are you aware that it is entirely possible for natural cyclic changes in ocean circulation patterns to be responsible for Gulf of Maine temperature changes to which you refer? Do you equate "climate change" with "human-caused-climate-change"? If so, on what truly scientific basis? How do you distinguish between natural climate change, and climate change you believe to be caused by humans? Have you considered that no reasonable person would disagree with clear evidence that lobsters are moving offshore in a warming Gulf of Maine, but that doesn't confer any legitimacy to the contention that such changes have anything to do with human activity? Do you believe intelligent people cannot read scientific material and make informed conclusions based on the information they learn? If so, who do you think taught the first teachers? Do you seriously believe that the views of your professor are superior to those of renowned international scientists whose opinions on the subject are shared by Sen. Cruz and differ dramatically from your professor's? What of the more than 30,000 scientists, including more than 9,000 PhDs who have gone on record supporting the view that humans have nothing to do with climate change? Do you believe they do not have sufficient knowledge and intelligence to make an informed decision contrary to your professor's? Is it scientific to be close-minded to views that are different from your own? Is that what you've been taught in public schools and college? Clearly, you are very young and passionate about the climate change issue. That is good. But you would do well to understand your obligation to both yourself and others that you be well-informed on the subject before you support it with the passion you displayed in your confrontation with Sen. Cruz. You made several statements that clearly demonstrated you are either misinformed or poorly informed and have not done your homework. First, you spoke of the Gulf of Maine warming. Did your professor tell you the cause of that warming? Did he discuss with his class any alternatives to the belief that such warming is the result of human production of CO2? If not, why not? Did he teach you anything about relatively short duration global atmospheric and oceanic circulation patterns that change on a cyclic basis? Or how such changes can dramatically affect things like the temperature of the Gulf of Maine or droughts or weather patterns that bring substantial snowstorms to the northeast? Did he provide you with sufficient background information that demonstrates recent climate warming is indistinguishable from climate warming in the past, well before human activity you blame for climate change? Can you tell which of the following 50-year periods is 1895-1946 and which is 1957-2008? 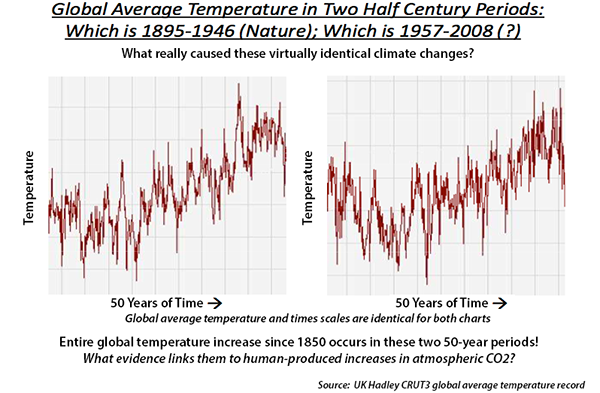 Can you (or your climate science professor) answer the questions posed on the chart above? Second, you indicated that your professor was a "climate scientist". Did he teach you about Earth's typical climate that is far warmer than anything humans have ever experienced? Are you aware that the age of dinosaurs was, climatologically, very, very recent and that the climate that existed for the 200+ million years of that age was typical of Earth's climate for most of the past 3.5 billion years? Did he tell you Earth's typical climate is nearly 18� F (10� C) warmer than anything humans have experienced, and that such climate has been the norm for 93% of the time since the earliest life first appeared on Earth? Did he inform you that during Earth's typical climate, there is no permanent ice at sea level anywhere on the planet? Did you learn Earth's typical very warm climate has been interrupted seven times by climate eras known as Ice Eras? Did he inform you an Ice Era can interrupt Earth's typical very warm climate for between 20 and 60 million years? Were you told Earth is in an Ice Era that began 60 million years ago at the end of the dinosaur era, possibly both events triggered by a major impact in the vicinity of what is today the Yucat�n Peninsula? Did you learn Ice Eras are punctuated by numerous Ice Epochs, even colder periods within Ice Eras that can span hundreds of thousands of years to a few million years? Were you taught Earth's climate during an ice epoch of an ice era experiences Ice Age cycles that typically span 100,000 years and which include both a long glacial and and short interglacial period? Did you learn these relatively warm interglacials range from 5,000 to 15,000 years duration? Were you taught Earth is currently near the end of a long interglacial period of an ice age cycle within an ice epoch of an ice era? Did your professor teach you about the major natural forces causing warm and cold phases of Earth's climate that include tectonic (continental drift), volcanic (geothermal), orbital (Milankovitch Cycles), solar (variability, as measured by sunspot activity) and relatively short duration cycles in global atmospheric and oceanic circulation? If not, you have not been taught the basics of natural climate variability which are an essential prerequisite for your understanding climate and natural climate change. Are you unaware that over the decade beginning in 1998 there was no global warming while atmospheric CO2 continually rose? How can you possibly form a valid opinion of the causes of the Gulf of Maine's warming if you are unaware of the natural climate cycles that are most likely the cause of such localized warming? Third, have you taken physics courses in college? Are you aware that, by far, the dominant source of heat on Earth is solar? Are you aware that a recent study found the typical surface temperature of a rocky planet (which include moon-sized objects) can be deterministically predicted based on only two variables, distance from the sun and weight of the atmosphere? That study accurately predicted the surface temperature of Venus, Earth, our Moon, Mars, Titan (largest moon of Saturn) and Triton (largest moon of Neptune). Based on the findings of this study, it is clear that Venus' surface temperature, incorrectly thought the result of "greenhouse" gases, would not change one iota if all the so-called "greenhouse gases" in Venus' atmosphere were replaced with non-greenhouse gases of the same molecular weight! Are you aware that surface temperatures of rocky planets having no atmosphere are determined exclusively by their distance from the star they orbit? Did you know that Venus is much hotter than Earth because (1) it is much closer to the sun and, (2) its atmospheric surface pressure is 90 times that of Earth's surface pressure? Are you aware that Earth's atmosphere has no special properties that allow it to multiply (or create) heat? Have you considered that the Earth system is composed of solids (land, etc. ), liquids (oceans, lakes, etc.) and gases (invisible atmospheric)? Are you aware that these elements are heated by the sun, without which Earth would be a frozen speck in the universe? The contention that greenhouse gases "add heat to" Earth by "trapping" heat necessarily means such gases could create extra heat in order to increase the temperature of Earth (to warm anything, a higher degree of heat must be supplied to it, either by conduction, convection or radiation). From where does the "extra" heat come to heat ("globally warm") Earth more? Are you aware that "climate scientists" use highly complex computer simulations of crude climate models as a gimmick to claim that there is some miraculous heat production process at work in our atmosphere that can multiply the heat energy from our sun by bouncing it around between the atmosphere and Earth's surface? If global warming greenhouse theory were valid, then why hasn't there been a real effort to develop "greenhouse furnaces" to help heat northern homes in winter? Isn't CO2 relatively abundant as the "fuel" for these furnaces? Do you recognize the difference between the mechanism by which solar radiation naturally heats Earth's atmosphere (just as it heats both lands and seas) and the premise of Anthropogenic Global Warming (AGW) theory that distorts that process by speciously claiming the atmosphere can multiply solar heat energy to create additional heat needed to claim responsibility for "global warming"? Do you recognize the specious nature of claims Earth is getting warmer as a consequence of the minuscule increase of atmospheric CO2 (0.25%) from human activity and that such pseudo-science quackery receives billions in annual funding from the US Government (your tax dollars being wasted to promote control of relatively abundant inexpensive energy)? Do you understand that atmospheric water vapor (H2O) overwhelms atmospheric carbon dioxide (CO2) in terms of both its abundance and capacity to interact with solar radiation in Earth's atmosphere? Do you realize that the greenhouse theory claim is analogous to a claim that if you walked into a mirrored room with a bright flashlight, the light would increase in intensity? While the light will be reflected around the mirrored room, the mirrored walls are incapable of making the light more intense, which is essentially the contention of advocates of greenhouse gas global warming who maintain Earth's temperature increases simply due to fluctuations in atmospheric CO2 (equivalent to adding or subtracting mirrors in the flashlight-in-a-mirrored-room analogy). Are you aware that natural solar warming of the atmosphere is compensated by atmospheric re-radiation (emissive cooling) and that such natural warming does not collect indefinitely in the atmosphere, and that radiative cooling is the basis for the stability of Earth's global average temperature? When solar energy increases, Earth both acquires and sheds more heat. When solar energy decreases, Earth both acquires and sheds less heat. Were you taught that, just as are the lands and waters of the Earth, its atmosphere is also warmed by the sun? Do you understand that the annual production of CO2 by humans constitutes just 4% to 5% of total annual natural natural production of CO2? Are you aware that CO2, far from being a "pollutant", is essential for all life on Earth and must be above a minimum level in Earth's atmosphere for life to exist? Did you learn that plants evolved when Earth's atmospheric CO2 levels were more than double what they are today? Do you realize that doubling atmospheric CO2 would enable agriculture to feed vastly more people without any consequences to global climate? Have you learned that if the US completely stopped any industrial emissions of atmospheric CO2, there would be no discernible impact on global climate? If you've been taught otherwise, you've been reprehensibly misled. Has your professor attempted to provide any cost-benefit analysis that shows substantially raising the cost of living and putting costly draconian limits on energy and industry will yield any economic benefit whatsoever? Did you know that CO2 from all sources is responsible for less than 5% of atmospheric greenhouse gases? This means human-produced CO2 represents at most 0.25% of atmospheric greenhouse gases! Twice over the past 106 years the greenhouse gas theory has been disproven experimentally. Predictions based on the greenhouse gas global warming theory have failed to occur. These include (1) no warming for 18 years running, (2) a cool spot in the tropical mid-troposphere where a "hot spot fingerprint" of human-caused-global-warming was predicted, (3) no dramatic rise in sea levels, and (4) failure of polar regions to warm dramatically (Arctic ice is now expanding and Antarctica continues its cooling that began six decades ago). Are you aware that satellite measurements of incoming solar heat energy on Earth are matched by measured heat energy radiated off the top of the atmosphere? If heat energy in equals heat energy out, there is balance. Therefore, any fluctuations in globally measured temperatures must be the result of any or a combination of factors such as (1) temperature measurement errors, (2) changes in solar output, or (3) other natural processes influencing surface climate that were identified above. Did you learn that over the past thousand years of observations, Earth's natural climate cycles have accurately tracked solar activity as measured by sunspots and that current sunspot trends indicate severe cold in the near future? Were you taught that, according to ice core data, over the past 400,000 years, Earth's temperature changes have preceded changes in atmospheric CO2 by an average of 800 years? If atmospheric CO2 responds to temperature, by what rationale do you believe a change in atmospheric CO2 is responsible for a temperature change that preceded it? Are you aware that the only basis for claiming recent years are the "warmest on record" is NOAA's "adjusted" (fudged) data that altered the real data record by adjusting downward earlier temperatures in an effort to discredit the inconvenient truth that the past 18 years has revealed no discernible global warming, despite IPCC predictions of substantial warming during this period? Did you know that the actual measured temperatures during the 1930s remain the warmest years on record? Do you know that NOAA's adjusted data does not match any other data set, including the gold standard at the UK MET office (Hadley CRUT) as well as well-documented US satellite data? Which are you inclined to believe? 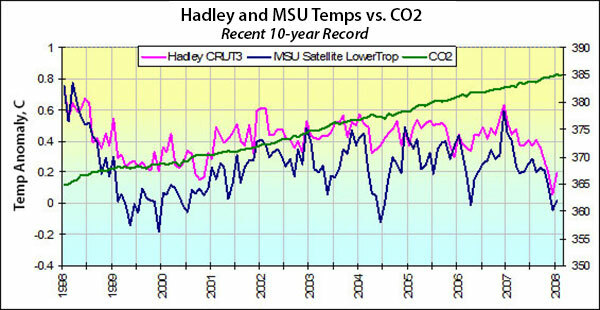 Conveniently adjusted data at NOAA designed to fit warmist dogma, or every other data set that exists on the planet? The answer to that question will tell you a lot about your objectivity and the extent to which you are prepared to question the premises your professor taught you. You owe yourself some serious introspection on this topic. Given that all legitimate science is based on accepted scientific laws (not theories), then you must understand that scientific theories are always subject to scientific scrutiny to either confirm their hypotheses or reject them if they fail the test of either experimentation or observation. It is the obligation of scientists to challenge theories, not to dogmatically defend them! You will truly learn by challenging dogma. Based on your recent exchange with Sen. Cruz, you evidently have not challenged your professor's dogma. Other than scientific law, do you seriously believe that any scientific theory is "settled science"? Would you agree that those who claim a theory is "settled science" are really attempting to stifle dissenting views? If scientists warned that Earth was entering another bitter cold glacial phase, do you honestly believe a proposal to compensate dramatic cooling by burning more fossil fuels would be taken seriously? Please direct any comments or questions to editor@webcommentary.com.